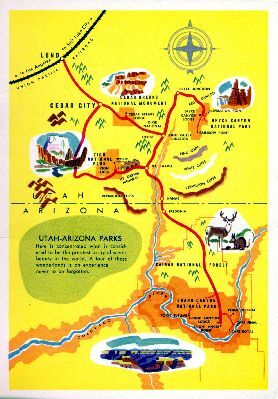 Boatright, Mody C. (1896-1970) Backwoods to border / Mody C. Boatright. Austin, TX: Texas Folklore Society; distributed by Southern Methodist University Press, Dallas, 1943. (Publications of the Texas Folklore Society, n.18) 235 p.
Boatright, Mody C. Mexican border ballads and other lore / Mody C. Boatright. Austin, TX: Texas Folklore Society; distributed by Southern Methodist University Press, Dallas, 1946. (Publications of the Texas Folklore Society, n.21) 140 p.
Boatright, Mody C. "More about 'Hell in Texas'." / Mody C. Boatright. Texas Folklore Society Publication. 19: 134-138, 1944. Boatright, Mody C. Singers and storytellers / Mody C. Boatright. Dallas, TX: Southern Methodist University Press, . (Publications of the Texas Folklore Society, n.30) 298 p.
Boatright, Mody C. Tall tales from Texas cow camps / Mody C. Boatright. Dallas, TX: Southern Methodist University Press, 1934. (Publications of the Texas Folklore Society) 100 p.
Boatright, Mody C. Texas folk and folklore / Mody C. Boatright. Dallas, TX: Southern Methodist University Press, 1954. (Publications of the Texas Folklore Society, n.26) 356 p.
Boatright, Mody C.; Hudson, William N.; Maxwell, Allen. Folk travelers: ballads, tales and talk / Mody C. Boatright, William N. Hudson and Allen Maxwell. Austin, TX: Texas Folklore Society; distributed by Southern Methodist University Press, Dallas, 1963. 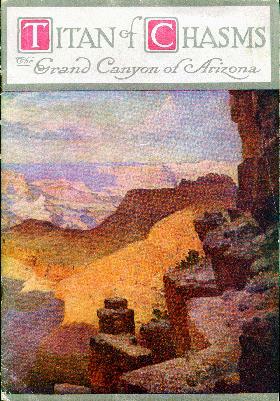 (Publications of the Texas Folklore Society, n.25) 261 p.
"Titan of Chasms: the Grand Canyon of Arizona." * Bond, Agnes Davenport. The lure of the open and other rhymes / Agnes Davenport Bond. Cincinnati, OH: Agnes Bond ("Printed for the author by The Caxton Press"), 1930. 96 p.
Bond, George (1903- ). Sketches of the Texas prairie / George Bond. np, 1922. See entry for February 5, 1936. Jackson is visited by John I. White (1902-1992), the "Lonesome Cowboy." White performed cowboy and western songs on his 1930s radio program, "Death Valley Days." Book of log cabin songs. 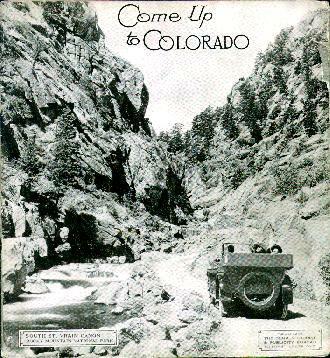 Edited by Albert E. Brumley. Albert E. Powell, MO: Stamps-Baxter Music and Printing, 1944. The book of the American west. Edited by Jay Monaghan. New York: Julian Messner, 1963. See: Ben A. Botkin "A sampler of western folklore and songs" p.501-560. Bordeur, Arthur K. "The Robert Winslow Gordon collection of American folksong." Oregon Folklore Bulletin. 1: 1-2, 1962. Includes Gail Gardner's "The dude wrangler." * Borne, Lawrence R. Dude ranching: a complete history. Albuquerque, NM: University of New Mexico Press, 1983. 322 p.
Boswell. Margie B. Ports of Call / Margie B. Boswell. np nd. And the Gulf of Mexico along the Santa Fe." Botkin, Benjamin. Play party in Oklahoma / Benjamin Botkin. Lincoln, NB: University of Nebraska Press, 1937. Botkin, J.T. "The American play-party song, with a collection of Oklahoma texts and tunes." University Studies of the University of Nebraska. 37(1-4): ?, 1937. Botkin, J.T. "Concerning a day when cowboys were cowboys." Collections of the Kansas State Historical Society. 16: 493-496, 1923-25. Bounds, Allene. "Colorful cowboys' Christmas ball inaugurated 53 years ago." Abilene (Texas) Reporter News. December 18, 1938. * Bowra, George B. My southwest. [Aztec, NM]: George B. Bowra, . 68 p. 2nd ed. �Poems originally published by Aztec Independence-Review, United Press Association and other magazines and newspapers.� See: �An old cowhand,� p.58. Brackenbury, Richard. Western sketches and war poems / Richard Brackenbury. La Jolla, CA: Richard Brackenbury, 1945. 129 p.
Bramlett, Jim. The original strawberry roan / Jim Bramlett. np: Jim Bramlett, 1987. Branch, Douglas. (1905-1954) The cowboy and his interpreters / Douglas Branch. Illustrated by Will James, Joe de Yong, and Charles M. Russell. New York: D. Appleton and Co., 1926. 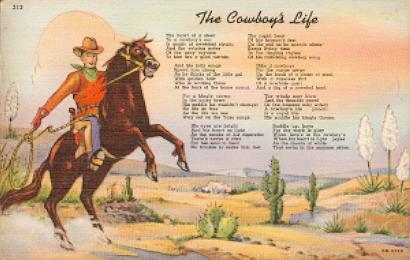 278 p. See ch.10 "Cowboy songs," p.162-179. * Branch, Douglas. The cowboy and his interpreters / Douglas Branch. Illustrated by Will James, Joe de Yong, and Charles M. Russell; introduction by Harry Sinclair Drago. New York: Cooper Square Pub., 1976, c1961. 278 p. Reprint of 1926 edition. See song references: p.79, 102, 240, 254, 259. Brand, Oscar. Bawdy songs and backroom ballads / Oscar Brand. New York: Dorchester Press (Grove Press), 1960. 96 p.
* Brandt, Theodine. Dawn to dusk / Theodine Brandt. Atlanta, GA: Banner Press, Emory University, 1944. 84 p. Illustrated by Josephine Meininger. Dj With announcement card for autograph copies from author, Denver, CO.
* Braunlich, Phyllis Cole. Haunted by home: the life and letters of Lynn Riggs / Phyllis Cole Braunlich. Norman, OK: University of Oklahoma Press, 1988. 233 p.
Riggs (1899-1954) was an American playwright (author of Green grow the lilacs), poet, screenwriter, gay, visionary, friend of Witter Bynner (also reference to poem describing male lover, p.13). * Breedlove, Mildred. Those desert hills and other poems. [np]: Mildred Breedlove, 1959. 95 p.
Breithaupt, Thelma. No silence heard / Thelma Breithaupt. Dallas, TX: Tardy, 1937. Brewer, Frank. Ballads of the Book Cliffs / Frank Brewer. np, 1973. Brewer, J. Mason. Negrito / J. Mason Brewer. San Antonio, TX: Naylor, 1933. "Zion, Bryce Canyon, Grand Canyon National Parks." [Los Angeles, CA]: Union Pacific Railway Co., 1962. Inside back cover. Bridger, Bobby. "The enduring presence of John Neihardt." p.46-58. In A sender of words: essays in memory of John G. Neihardt. Edited by Vine Deloria, Jr. Salt Lake City, UT; Chicago, IL: Howe Brothers, 1984. Briegel, George F. 44 old time Mormon and far west songs / George F. Briegel. New York: G.F. Briegel, 1933. Briegel, George F. All star collection of cowboy ballads and far west songs / George F. Briegel. New York: G.F. Briegel, 1934. Briegel, George F. Collection of rodeo songs and cow-hand ballads / George F. Briegel. New York: np, 1937. Briegel, George F. Souvenir collection of American's greatest cowboy songs for piano and voice / George F. Briegel. New York: np, 1938. Narrative poem on the life of Jeff Boone, grandson of Daniel Boone. * Brininstool, E.A. "A cattle range at night," p.37, and "The coming of the rain." p.69-70. In Covered wagon days. Edited. by Oliver G. Swan. New York: Grosset and Dunlap, 1928. 274 p.
* Brininstool, E.A. Trail dust of a maverick / E.A. Brininstool. Los Angeles, LA, Gem Publishing, 1926, c1914. 95 p.
* Brininstool, E.A. Trail dust of a maverick: verses of cowboy life, the cattle range and desert / E.A. Brininstool. 2nd edition. Reprinted introduction to 1st ed. by Robert J. Burdette; introduction to 2nd ed. by George Wharton James. Los Angeles, LA: E. A. Brininstool, 1921, c1914. 244 p.
Brockett, Bruce. Fenced trails and other poems / Bruce Brockett. Illustrated by Bill Sullivan; introduction by Charles Franklin Parker. 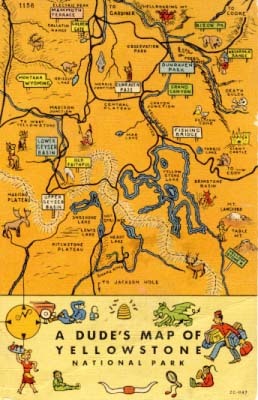 Prescott, AR: Arizona Publishers, 1948. 32 p.
* Bromwell, Henry Pelham Holmes. The song of the Wahbeek: a poem / Henry Pelham Holmes Bromwell. Denver, CO: Henrietta E. Bromwell, 1903. 195 p.
Inscribed to Clarence Smith by Henrietta Bromwell. Bronson, Bertrand. "Cecil Sharp and folksong: a review article." Western Folklore. 27: 200-207, 1968. * Brooks, Fred Emerson. Old ace, and other poems / Fred Emerson Brooks. Boston, MA; Chicago, IL: Forbes & Co., 1900, c1894. 208 p.
Brophy, Robert. Robinson Jeffers: myth, ritual and symbol in his narrative poems / Robert Brophy. Cleveland, OH: Press of Case Western Reserve University, 1973. * Brown, A.E. Throbs from the west / A.E. Brown. 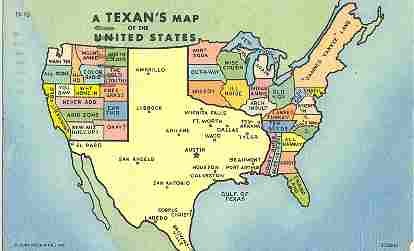 El Paso, TX: Brown, 195- 80 p.
"A Texan's map of the United States." Brown, Dee. " The power of John Neihardt." In A sender of words: essays in memory of John G. Neihardt. Edited by Vine Deloria, Jr. Salt Lake City; Chicago : Howe Brothers, 1984. p.5-11. Brown, Tex. "Branding fire song book." Thrilling Ranch Stories. 39(1): 52-53, March 1949. Browning, James A. The Western reader's guide: a selected bibliography of nonfiction magazines, 1953-91. Edited by James A. Browning. Stillwater, OK: Barbed Wire Press, 1992. 344 p.
Brumley, Albert E. Songs of the pioneers: a collection of songs and ballads of the romantic past / Albert E. Brumley. Powell, MO: Albert E. Brumley & Sons, 1970. Brunvand, Jan Harold. "Folk song studies in Idaho." Western Folklore. 24: 231-248, 1965. * Brunvand, Jan Harold. "Sailor's and cowboys' folklore in two popular classics." Southern Folklore Quarterly. 29: 266-283, 1965. On R.H. Dana's Two years before the mast and Andy Adam's The log of a cowboy. See Log for songs, p.55, etc. "A dude's map of Yellowstone National Park." Brunvand, Jan Harold. The study of American folklore / Jan Harold Brunvand. New York: Norton, 1968. * Buck Jones rangers-cowboys collection: with tenor banjo and guitar arrangements. New York: Amsco Music Sales, 1935. 62 p. (Official Buck Jones Rangers' manual no.1). Buckaroo ballads: the golden west in songs and pictures. Edited by Kenneth S. Clark. New York: Paull-Pioneer Music, 1940. 64 p.
Buckley, Bruce. "'Frankie and her man': a study of the interrelationship of popular and folk traditions." PhD dissertation, Indiana University, 1962. On the song "Frankie and Johnny." Bulla, Clyde Robert. Surprise for a cowboy. Illustrated by Grace Paull. New York: Thomas Y. Crowell Co., 1950. 82 p.
Three cowboy songs with piano accompaniment. Burnside, Wesley M. Maynard Dixon: artist of the West / Wesley M. Burnside. Provo, UT: Brigham Young University Press, 1974. 237 p.
See Dixon poems at the beginning of each chapter: "Visionary" p.2, "Prairie sunrise" p.12, "Laguna perdida" p.28, "Quest" p.46, "The plains" p.58, p.73, "The iron road" p.100, "The years," p.135. * Burroughs, John Rolfe. Where the old West stayed young / John Rolfe Burroughs. New York: Bonanza Books, 1962. 376 p.
See: "The king of saddle land" p.196; and James Harl Sizer's "A cowboy at the Two Bar" p.196-197 and lines from Gene Linberg's "The old timer" p.197. Burt, Olive Woolley. "Murder ballads of Mormondom." Western Folklore. 18(2): 121-130, April 1959. * Burton, Jack. The blue book of Tin Pan Alley: a human interest anthology of American popular music / Jack Burton. Watkins Glen, NY: Century House, 1951. See "Billy Hill, 1899- 1940," p.445-447. He wrote "Wagon wheels," 1931; "The last roundup," 1933, both introduced in the Ziegfeld Follies of 1934; "Empty saddles," 1934. Bushby, D. Maitland. Mesquite smoke, and other poems / D. Maitland Bushby. Philadelphia, PA: Dorrance, 1926. 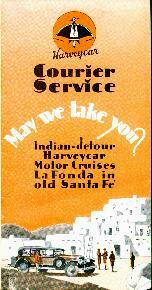 Harveycar Courier Service: May we take you? * Bynner, Witter (1881-1968). Against the cold / Witter Bynner. New York: Alfred A. Knopf, 1940. 125 p.
Bynner, Witter. "Alice and I." New Mexico Quarterly Review. v.19, Spring 1949, p.34-?79. * Bynner, Witter. The beloved stranger: two books of song and a divertisement for the unknown lover / Witter Bynner. Preface by William M. Reedy. New York: Alfred A. Knopf, 1919. 99 p.
* Bynner, Witter. The beloved stranger: two books of song and a divertisement for the unknown lover / Witter Bynner. Preface by William Marion Reedy. New York: Alfred A. Knopf, 1922. 2nd printing. 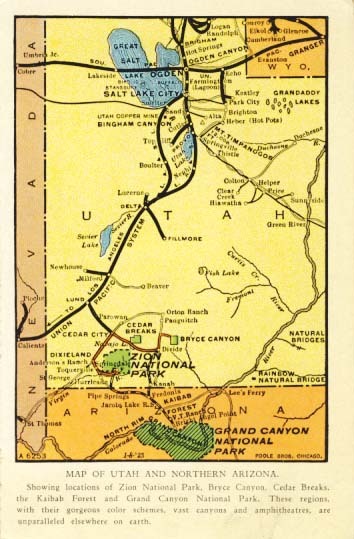 99 p.
Inscribed to John Goodwin (New English Weekly), includes letter, dated April 16, 1932: "I especially thought of you with a pang when I heard the grim news about Peter Stockton..."
"Map of Utah and northern Arizona"
[Omaha, NB]: Union Pacific System, [192-]. "Poole Brothers, Chicago, A-6253." 102089. * Bynner, Witter. The beloved stranger: two books of song and a divertisement for the unknown lover / Witter Bynner. Preface by William M. Reedy. New York: Alfred A. Knopf, 1930. 3rd printing. 99 p.
* Bynner, Witter. Book of lyrics / Witter Bynner. New York: Alfred A. Knopf, 1955. 125 p. No.1414 of 1750. * Bynner, Witter. A canticle of pan and other poems / Witter Bynner. New York: Alfred A. Knopf, 1920. 214 p.
* Bynner, Witter. Caravan / Witter Bynner. New York: Alfred A. Knopf, 1925. 77 p.
See: "Sonoma" p.19-20; "Lorenzo" p.39; "D.H. Lawrence" p.40-44. * Bynner, Witter. Caravan / Witter Bynner. 2nd printing. New York: Alfred A. Knopf, 1926. 77 p.
* Bynner, Witter. Eden tree / Witter Bynner. New York: Alfred A. Knopf, 1931. 111 p. Inscribed to Rheva Shoemaker. Acknowledges Bynner's homosexuality, see p.84. * Bynner, Witter. Grenstone poems: a sequence / Witter Bynner. New York: Frederick A. Stokes, 1917. 307 p.
* Bynner, Witter. Indian earth / Witter Bynner. New York: Knopf, 1929. 77 p.
* Bynner, Witter. Journey with genius: recollections and reflections concerning the D.H. Lawrences / Witter Bynner. New York: John Day Co., 1951. 361 p. See poem: "D.H. Lawrence," p.325-327. * Bynner, Witter. Light verse and satires: the works of Witter Bynner / Witter Bynner. Edited and with an introduction by William Jay Smith; general editor James Kraft. New York: Farrar Straus Giroux, 1978. 301 p.
All of the hoax, Spectra, is included. * Bynner, Witter. The pamphlet poets / Witter Bynner. New York: Simon and Schuster, [1927, 1926]. 30 p.
* Bynner, Witter. Selected poems / Witter Bynner. Edited by Robert Hunt, with a critical essay by Paul Hogan. 2nd ed., rev. New York: Alfred A. Knopf, 1943. 309 p. Inscribed. * Bynner, Witter. Selected poems: the works of Witter Bynner / Witter Bynner. Edited and with a critical introduction by Richard Wilbur; biographical introduction by James Kraft. New York: Farrar Straus Giroux, 1978. xlix, 254 p.
"Long autobiographical poem describing male lover, Paul, 1931". * Bynner, Witter. The selected Witter Bynner: poems, plays, translations, prose and letters / Witter Bynner. Edited by James Kraft. Albuquerque: University of New Mexico Press, 1995. 326 p.
* Bynner, Witter. Take away the darkness / Witter Bynner. New York: Alfred A. Knopf, 1947.  p.
* [Bynner, Witter] Witter Bynner: a bibliography / by Robert O. Lindsay. Albuquerque: University of New Mexico Press, 1967. 112 p. University of New Mexico Publications Library Series, no. 2.